Buy the T-shirt. But remember: please purchase the Expanding College Opportunity Book & Student Workbook. We have a video series of the book too! We would love to add your picture to our Photos of the Month Gallery. 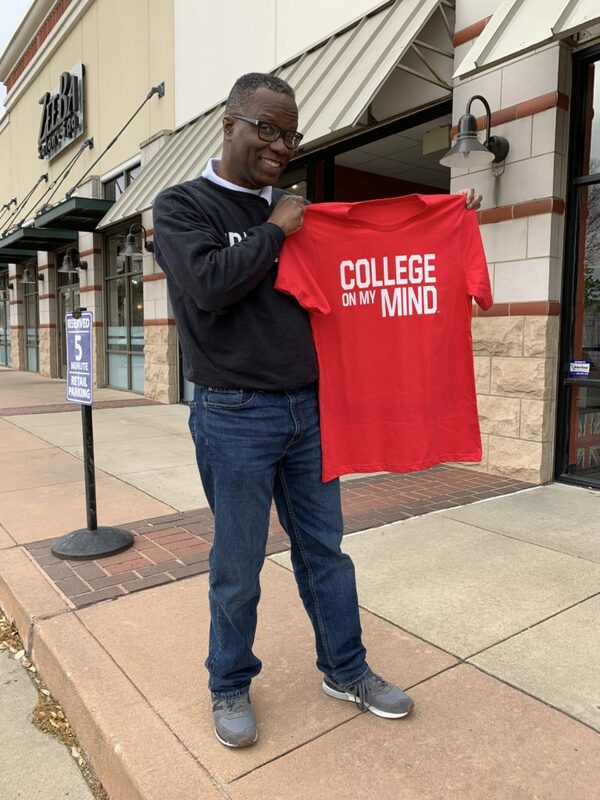 When you purchase your shirt or combo package with the shirt and the Expanding College Opportunity books, you’ll receive an email with instructions on how to submit your favorite College On My Mind photo(s). Reading the Expanding College Opportunity Book and Student Workbook. Tell us how many books and shirts you want or need. Returns must be made within 30 days. Unfortunately, if more than 30 days have gone by since your purchase, we can’t offer exchanges. To be eligible for a return, your item must be unused and in the same condition that you received it. Refunds will not be issued but we will gladly replace it with another size or item. To complete your return request, please do the following two things: 1) send us an email at customerservice@expandingcollegeopportunity.com with proof of purchase, and 2) send your item to: P.O. Box 601001, Dallas, Texas 75360. To return your product, you should mail your product to: P.O. Box 601001, Dallas, Texas 75360. You will be responsible for paying for your own shipping costs to return your item(s) to us. We will cover the cost to ship the replacement item back to you. If you are shipping items totaling over $75, you should consider using a trackable shipping service or purchasing shipping insurance. We don’t guarantee that we will receive your returned item. If the item was purchased at an event, expo or any other special event, we do not accept any returns or exchanges.